Does My Dog Need to Wear a Jacket When Hiking in the Winter? You are here: Home / Hiking & Camping Tips / Does My Dog Need to Wear a Jacket When Hiking in the Winter? Unless your dog is an Arctic breed that is selectively bred to withstand subzero temperatures, they could probably use at least one warm jacket to get them through the winter safely and comfortably. 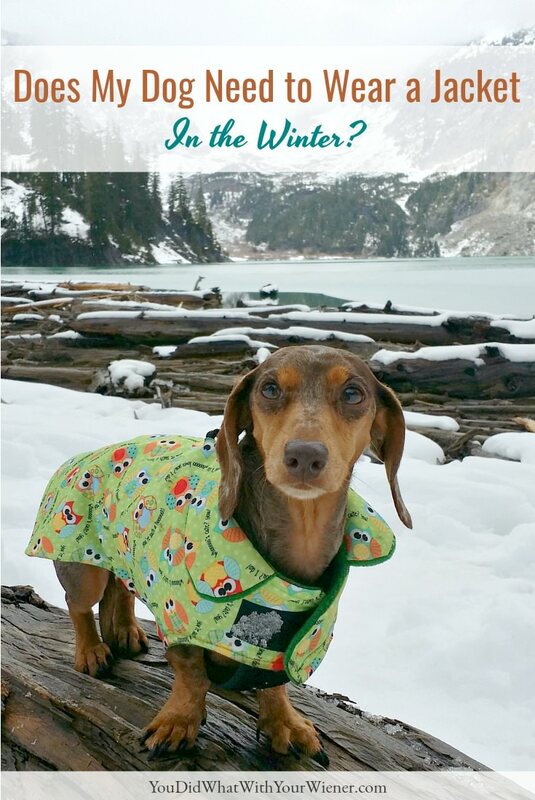 Dog jackets aren’t just for looks – they can keep your dog’s body temperature stable when they go outside for potty breaks each day, on quick walks, and on long winter hikes. There’s no set temperature at which your dog should wear a jacket. Every dog has an individual tolerance for the cold. Naturally, a Pomeranian with a full double layered coat will be able to handle the cold better than a dog with a very thin coat, like a short-haired Dachshund. 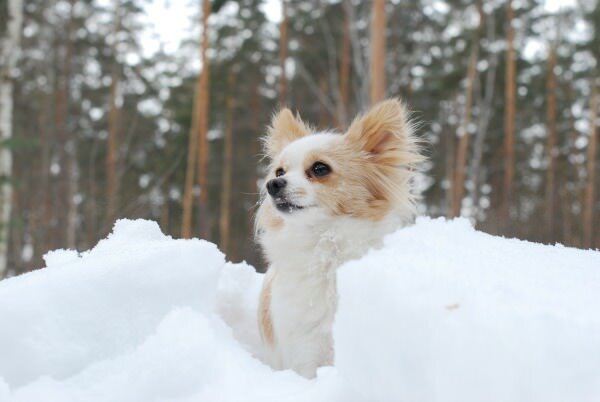 Your dog’s size will also affect their sensitivity to cold weather. The smaller the dog, the harder it is for them to keep their core temperature elevated. This means it’s unlikely they will tolerate cold well. According to PetMD.com, the smaller a dog is, the more skin they have (in relation to their “insides”) through which to lose heat (larger surface area to volume ratio). Gradual conditioning is the best way to increase your dog’s cold tolerance. Have you noticed that 50 degrees feels chilly in October, but comfortable in March? As you’re exposed to the cold in the winter, you become conditioned to it. It’s the same for dogs. If you consistently take your dog out as the seasons change, they’ll be able to handle outings on even the coldest days. The easiest way to figure out when your small dog needs to wear a jacket is to look for signs that they are getting too cold without one. It’s worthwhile to take the time to put your dog’s jacket on, even for fast potty breaks. Though it will take an extra few minutes, you may soon find that your dog does not mind wearing their winter ensemble, and may even duck their head or lift their paws to make it easier for you to clothe them. 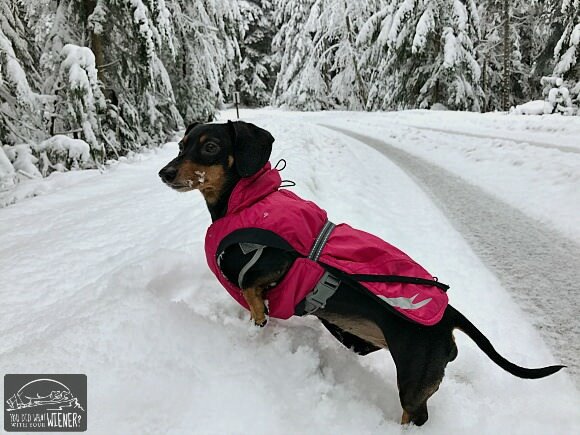 If you put your dog’s jacket on regularly for short periods of time, they will learn to get used to it and will be more comfortable wearing it on long hikes or snowshoe trips when they need it most. 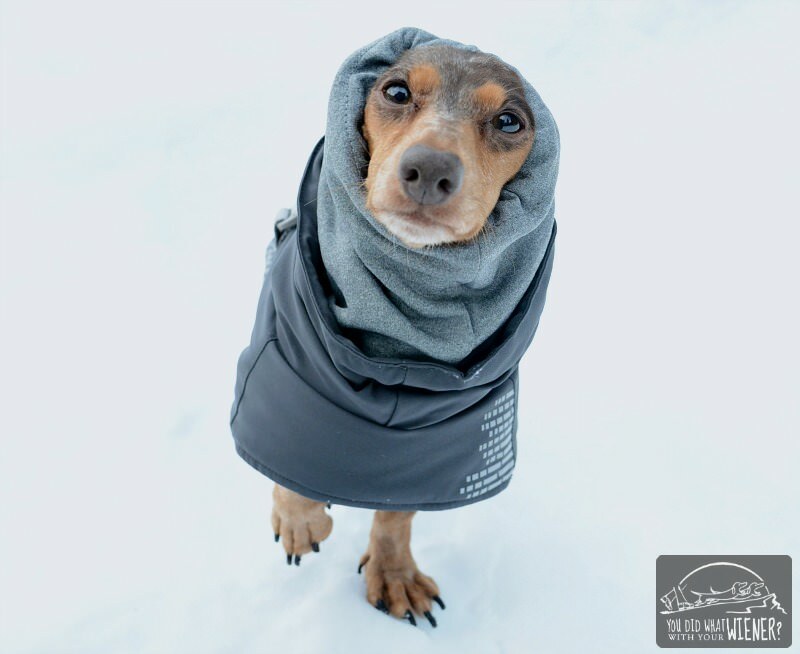 Wearing a jacket can help keep your dog safe against the health risks of getting too cold. Just like people, dogs can suffer from frostbite and hypothermia. To help keep them safe, take regular breaks to touch your dog’s ears, tail and feet. If they’re getting pale, very cold or stiff, you’ll need to warm them up to prevent frostbite, which could cause permanent tissue damage. Tip: feel your dog’s body too. If their core temperature is very warm, they will better be able to keep their extremities warm too. Also be on the lookout for a rapid heart rate, moderate shivering and other symptoms of hypothermia in dogs. You can avoid these health risks by making sure your dog has the right winter jacket, especially if you’ll be taking them on winter hikes. You’ll find many dog jackets at a wide range of price points, but expensive does not mean high quality, and not every coat is suitable for every dog. When shopping, take into consideration your dog’s body type, shape (barrel-chested or long and lean), what kind of weather they will be wearing it in, and desired features. Do you need specific features like an opening for their harness, or reflective strips for visibility at night? Does it need to be waterproof because your dog might be wearing it in the rain or wet snow? Is the jacket a-few-sizes-fits-all or is it custom made to fit your dog’s body shape (or a brand known to fit dogs with deep chests and long bodies)? An ill-fitted coat may be too large in some areas of the body, allowing cool air to seep in, and too tight in other areas, restricting your dog’s movement. When you buy a new coat, try it on indoors and see if your dog can move freely in it without falling off. If your dog can walk, run and climb stairs normally in their new jacket, they will most likely be able to comfortably wear it on walks and hikes too. 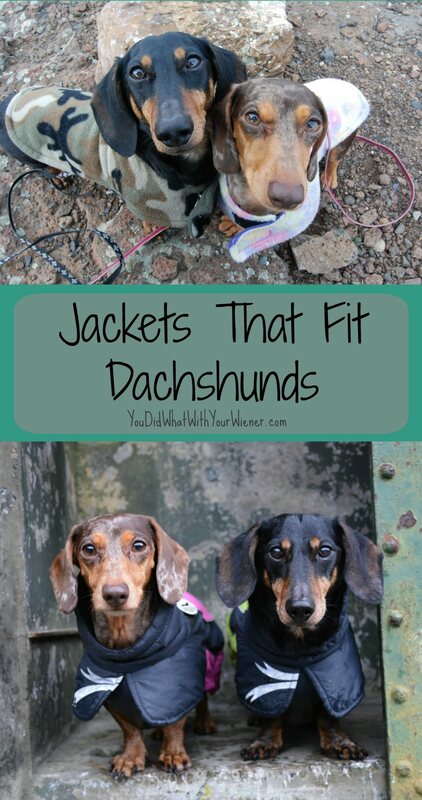 It’s tough to find well-fitted coats for Dachshunds and other small dogs with long bodies, deep chests and short legs. Check out our personal list of great jackets for small dogs. Remember, just because a jacket looks good on, doesn’t mean it’s the right one for your dog. I have a couple harnesses for Gretel and Chester that are awesome for all-day use and short walks. However, after walking for over two hours, they’ve caused chafing in their arm pits and on the chest. You may have to try a few before you find the right mix of form and function. Make sure the store from which you shop has a good return policy so you can get your money back if the jacket is not right for them. Even when you find the “perfect” jacket, remember that it might not go over well with your dog on the first try, especially if they’ve not worn a jacket or shirt before. It’s not unusual for dogs to squirm or bite at their jacket at first, especially while they are indoors and not cold. Some dogs – especially Dachshunds – are prone to “the freeze” (note: bribing with treats can work great for these dogs). They might be all happy to go on an adventure but stop and stand still, refusing to budge, once you put their coat on. If y our dog is not comfortable in the jacket right away, you’ll need to take some time to get them used to it. You should always try on a new jacket indoors first to make sure that it fits well and there are no obvious chafing points. But then your dog has the best chance of getting used to wearing it if you try it outdoors when on a walk. Your dog will be more likely to appreciate the extra warmth and they may forget they are even wearing the jacket with all of the exciting sights and smells outside. Have your dog wear the coat 5-10 times around the neighborhood until it’s clear that they’re comfortable enough walking in it. Then try it on short hikes. If that goes well, you can make them longer. in varying weather. Like my warning about harnesses and active dogs, there is the possibility that a jacket can chafe your dog’s skin, especially when wet and dirty. If there is no visible chafing after your short hikes, it’s safe to make them longer. Make sure to check for chafing DURING these longer hikes as well as after. That way you can catch any problems before they get bad and head back to the car and the first signs. Once your dog gets used to their new jacket, they may enjoy and tolerate the cold winter weather better. That means that you and your dog will be able to stay out longer, have more fun, and make more memories with each other. Honey loves the cold and snow. She used to beg to go outside to make snow angels. Afterward, she would happily lie in the snow. But I did find one situation in which a coat was beneficial for her as well. Dogs with furry bellies and feet can collect ice balls that can pull on their skin similar to matted fur. If we were going to be in heavy snow for a long time, sometimes I’d slip a small, long-sleeved t-shirt on her just to keep too many ice balls from forming until we could get her home. Yeah, I’ve learned that snowballs can be a real problem. I’ve never owned a long haired dog so that doesn’t come into play for me. However, ice has stuck to the hair between Gretel’s foot pads before and I know that is very painful. My Poodles love clothes but the other two dogs hide as soon as they see them. I’ve tried everything. What do you consider “everything”? I’m not doubting that you have tried many things. I’m just trying to see if I have a new idea that might help. Well, it doesn’t ALWAYS mean that. Gretel does it even when it’s warm out because she is looking for a treat. However, if it’s cold out, Rosie is shivering, and she is doing it, it may mean she is getting too cold. We usually remedy that with a super warm jacket (as you are doing) and by getting moving again so she can build up some body heat. If we stop for a prolonged break, I place a blanket on the ground she can stand on/snuggle in. Yes, I carry a blanket for her in my big backpack. Gotta do what you gotta do. Ha, ha. Great Post. Great tips for us in the Dakotas in the winter.